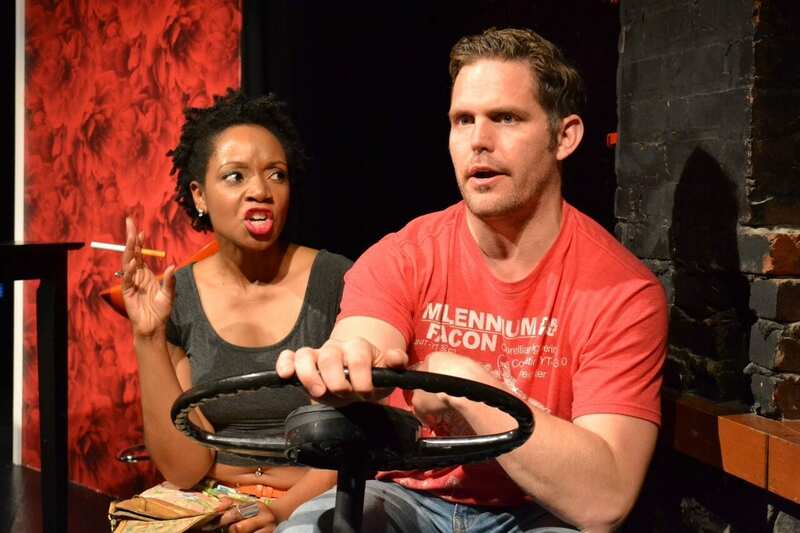 Gus Halper, Lillian Castillo, Emily Rohm, Kholby Wardel,l Alex Wyse and Tiffany Tatreau in RIDE THE CYCLONE. Photo by Joan Marcus. Emily Rohm. Photo by Joan Marcus. If the kids from The 25th Annual Putnam County Spelling Bee decided to stage a production of Godspell, it might look a lot like Ride the Cyclone, the rocking, if disjointed and odd, musical that has made its way to the Lucille Lortel Theatre after a run last year at the Chicago Shakespeare Theater. Six quirky kids, and one guy dressed as a fortune teller machine, compete for redemption and resurrection in a purgatory where a human-size rat plays bass guitar. There are also alien kittens, a transvestite French prostitute dance number and references to Taco Bell and Macklemore. With me so far? The play’s title refers to a roller coaster. It seems that the ill-fated Saint Cassian High School Chamber Choir boarded the Cyclone and minutes later perished in a freak accident involving a broken axle. But as the show begins, we find that the students have landed in a haunted after-life amusement park warehouse, overseen by the mechanical Amazing Karnak (Karl Hamilton). Rarely can you say that a performance is literally electric, but Mr. Hamilton does what he can while stuck in a booth with his power source in peril. The dead yet lively students include the chubby girl, Constance (Lillian Castillo), the foreign student with the funny accent, Mischa (Gus Halper), the requisite gay kid, Noel (Kholby Wardell), the nice handicapped boy, Ricky (Alex Wyse), and the stuck up Ocean O’Connell Rosenberg (Tiffany Tatreau). There is also the eerie Jane Doe (Emily Rohm) who is otherwise unidentifiable, having been decapitated in the crash. Given the weak plot device of a promised re-birth for just one of them, the show unwinds with each character pleading his or her case in song and dance. The charismatic cast include many of the Chicago company members. Most notably, Ms. Tatreau joined the New York production just two days before its opening, replacing Taylor Louderman who left over artistic differences. Her performance was nonetheless flawless and we end up liking her more than we probably should. As a boy set free of his crutches by death, Mr. Wyse lets loose and shows impressive range in his bizarre number, “Space Age Bachelor Man,” causing Mischa to impart the evening’s dopiest line of dialogue, “We’ll listen to you now, Space Jesus.” Mr. Halper plays the crotch-grabbing Mischa with the wacky passion one expects of a Ukrainian rap singer. Ms. Rohm, a strong soprano, benefits from portraying the only character that seems at home in this spooky outpost. 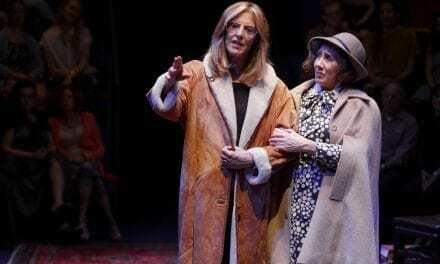 Her Jane, with a persona that is free from stereotyping and blessed with director/choreographer Rachel Rockwell’s best staging of the night, often owns the show. The Canadian writing team of Brooke Maxwell and Jacob Richmond have no experience to speak of in creating staged musicals and that is fairly evident even without reading the Playbill. Karnak spends an inordinate amount of time just narrating backstory to the audience. The various relationships between the kids are hard to believe, at best. And worst of all is the resolution of Jane Doe. When we are finally given her history it comes not as, you know, a musical number, or even a dream ballet, but as a short film projected on the backdrop as the cast remains static. The duo, however, are quite good at serving up catchy, rock-tinged melodies. Mr. Richmond’s background is in cabaret and indeed the show works best when looked at in this way, as a musical revue with wild songs where nothing necessarily needs to connect logically and where the dead can find peace without resorting to metaphors about life’s ups and downs. 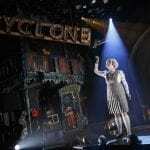 Ride the Cyclone – Book, music and lyrics by Jacob Richmond and Brooke Maxwell. Directed and choreographed by Rachel Rockwell. WITH: Alex Wyse (Ricky), Gus Halper (Mischa), Lillian Castillo (Constance), Karl Hamilton (Karnak), Emily Rohm (Jane Doe), Tiffany Tatreau (Ocean) and Kholby Wardell (Noel). Scenic design by Scott Davis, costume design by Theresa Ham, lighting by Greg Hofmann, sound by Garth Helm, and projections by Mike Tutaj. Musical supervision by Doug Peck and musical direction by Remy Kurs; Katherine Wallace, production stage manager. MCC Theater at the Lucille Lortel Theatre, 121 Christopher Street, 212-352-3101, http://mcctheater.org/shows/16-17_season/ride-the-cyclone/index.html. Through December 29, 2016. Running time: 90 minutes.